Alan Murray, one of Maybole's best loved sons who has died age 66. 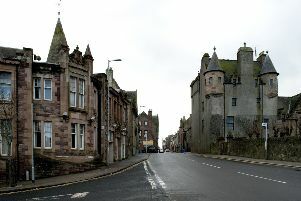 There is sadness in the town of Maybole this week as one of its most well known residents passed away at the weekend. Alan Murray, 66, died on Saturday morning. He had moved to the town from Glasgow in 1972 and despite not planning to stay long, he found himself becoming immersed in the town. And it’s down to Alan’s involvement in many different activities that there is a great sense of loss in Maybole. Alan was a founder member of the Carrick Rugby Club, and as the club went from strength to strength in recent years Alan played a key role in improving facilities and promoting the image of the club in the community with his role in the committee. He also served North Carrick and Maybole West as a councillor from 1999-2007, in South Ayrshire as a representative of the Labour Party, showing his commitment to the town he had made a life in. Alan was also at the forefront of one of Maybole’s most recently successful projects as the Carrick Centre opened up in 2012. It has become home for many fundraising activities and also to a foodbank as well as being a vital hub for the town. In his role as resource manager of the centre, Alan ensured it was extremely well run. A full obituary will appear after Alan’s funeral.